What do care assistants, hairdressers, plumbers and chefs all have in common? 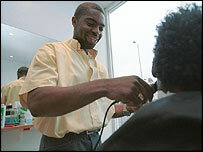 They are the happiest workers in the UK according to a nationwide report by qualifications body City and Guilds. Its index of happiness in the workplace found tradesmen and women were twice as likely to be "extremely happy" in their jobs compared to white-collar workers. City and Guilds said the report showed there is more to life than a high-powered office job or big salary, namely job satisfaction and enjoyment. "It's a misconception that white-collar professionals have the best jobs and are therefore the happiest," said Chris Humphries, deputy director at City and Guilds. "As our research proves, it's often people in vocational careers that are the most content and fulfilled." At the other end of the City and Guilds survey, the most miserable workers were estate agents, followed by media workers, pharmacists and accountants. Overall, more than a fifth of trade professionals are "extremely happy" with their job, compared with only 9% of white-collar employees. Care assistants are deemed the most contented workers, with 40% "very happy". Mr Humphries added: "There is an increasing trend for people to swap careers to do something more hands on. "A lot of employees are starting to realise that job satisfaction is more important than any other consideration, including money. "You spend such a lot of time at work, it's vital to enjoy what you do."